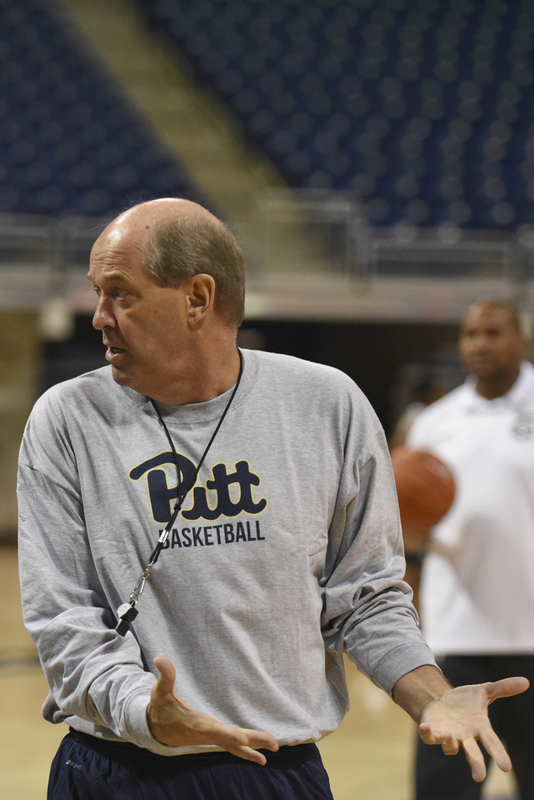 New Pitt men’s basketball coach Kevin Stallings knows his first season won’t be easy. But as challenging as the Panthers’ schedule may be — with two matchups against Virginia, which made it to the Elite Eight in last year’s NCAA Tournament, and Syracuse, which beat Virginia to get to the Final Four — gaining fans’ support may prove to be even tougher. When the Panthers hired Stallings to replace Jamie Dixon in March, both he and Pitt Athletic Director Scott Barnes came under intense criticism from local and national media for supposedly downgrading based on Stallings’ track record at Vanderbilt. At the same time, Pitt fans set Twitter ablaze with threats to cancel their season tickets orders. The pessimism carried over into the introductory press conference in late March –– an event commonly used to paint a bright future for the program. For the entire conference, Barnes and Stallings struggled to defend themselves against the press’s difficult questions, such as why Stallings blocked Sheldon Jeter’s transfer to Pitt and why Barnes used a search firm led by Vanderbilt’s former athletic director to find the Panthers’ new coach. Even before he was officially hired, the majority of Pitt fans wrote off the coaching hire as a failure. They looked at Vanderbilt’s recent history of mediocrity and assumed the difference between the two programs was their coaches alone. But Pitt’s program is not the same as Vanderbilt’s, and it shouldn’t be treated like it is. Until 2013, Pitt played in the Big East Conference, a league filled with top teams and NBA-bound players. The lure of playing in the Big East gave Pitt the opportunity to recruit in the talent-rich areas of the Northeast and build a powerhouse program. Vanderbilt, on the other hand, plays in the Southeastern Conference, arguably the weakest of the Power Five conferences. The Commodores also have stricter academic regulations for their student-athletes than most schools, making recruiting much harder. “If there were 100 kids that were Division I college basketball players, we could probably recruit 25 or 30 of them,” Stallings told local radio station 93.7 The Fan on March 28, estimating that put him at a disadvantage of about 50 to 60 percent compared to other schools. But even with the recruiting restrictions, Stallings managed to pull in higher-ranked classes during his tenure at Vanderbilt. There, he was a two-time SEC coach of the year and led the Commodores to seven NCAA tournament appearances –– more than half of the program’s total since the tournament expanded to 64 teams in 1985. Over the past three years, Pitt’s classes have had an average ranking of No. 90 nationally while Vanderbilt has been No. 48, according to 247Sports. For his first recruiting class at Pitt, Stallings will have to fill five scholarship positions, making this incoming class the largest and most important one in recent Pitt history. Thus far, the class has four three-star recruits in power forward Terrell Brown, shooting guard Jared Wilson-Frame and point guards Aaron Thompson and Marcus Carr. The group –– currently rated 44th –– isn’t going to turn many heads, but each player has the potential to be a solid contributor. Last week, when Carr became the fourth commit of 2017, some still found a way to scold the class. “If Stallings doesn’t bring in some MAJOR recruits to fill the vacuum left by [Michael] Young, [Jamel] Artis and [Sheldon] Jeter … next year is gonna be a LONG, LONG year,” one fan remarked on Pitt sports blog Cardiac Hill [emphasis theirs]. In his first few weeks, Stallings managed to hold former coach Dixon’s recruiting class together, keeping each of the three recruits. Recently, he has tried to build excitement around the program with events like Throwback Throwdown –– where he drained a buzzer beater –– and a Pitt basketball weekend featuring an open scrimmage, yet fans remained reluctant to let go of their first impressions. Instead, they talk about how forward Artis is transitioning to point guard for the upcoming season. This change — questionable at worst — has been polarizing within the fanbase, with some focusing on Artis’ large number of turnovers and obvious lack of experience. Following the news, Cardiac Hill published an article detailing the pros and cons of the change, and skeptics have been eager to share their thoughts as well. As stated, the Pitt offense has been anything but stellar in recent years. Last season, the Panthers ranked No. 130 in scoring offense, including horrendous outputs of 41 against Louisville and 43 against Wisconsin. If Stallings wants to switch up the team’s look, he should be able to do so without criticism. Power Five programs should never be scoring 41 points in a game. Pitt fans don’t have to look back far to spot another instance where they jumped to conclusions. Just last year, they questioned first-year football coach Pat Narduzzi when he effectively forced out incumbent quarterback Chad Voytik in favor of little-known Tennessee graduate transfer Nathan Peterman. Now, Peterman is Pitt’s starter and has a quarterback rating of 152.3 while Voytik transferred to Arkansas State, where he recently lost the starting job. The second-guessers were wrong then –– and they may be wrong now too. Now, they should believe that Stallings knows what he is doing and go along with it. These feeling toward Stallings, of course, will only intensify if the team does poorly this season. Fans might have to be patient, something many don’t want to hear. Stallings’ first team will be made up entirely of players Dixon recruited. This could be a positive, as the Panthers return six of their seven leading scorers from last year’s NCAA tournament team. It could also be a negative if Stallings fails to adapt to his players’ strengths. Either way, people should give Stallings the opportunity to recruit and develop his own players before making any judgements. If, in three or four seasons, the team is far out of NCAA tournament contention, then people can start calling for his firing. Until then, Pitt fans need to forget their early assumptions and let Stallings take a shot. After 23 years of coaching, he deserves it.